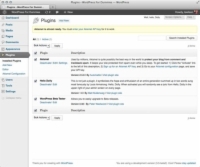 1Back up your WordPress website. Backing up your website before updating is an important step in case something goes wrong with the upgrade. Give yourself some peace of mind knowing that you have a full copy of your website that can be restored, if needed. Do not to skip this step under any circumstances. On the Dashboard, hover your pointer over Plugins on the navigation menu and click the Installed Plugins link. Select all plugins by selecting the check box to the left of the plugin names listed on that page. In the drop-down list at the top, select Deactivate. The WordPress Updates page appears. 4Click the Update Automatically button. The Update WordPress page appears with a series of messages. 5Click the Go to Dashboard link. The Dashboard page appears in your web browser. Notice that both the update alert message at the top of the site and the notification bubble on the Dashboard menu are no longer visible. 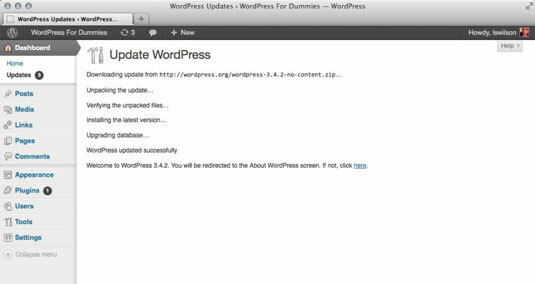 Your WordPress installation is now using the latest version of WordPress. 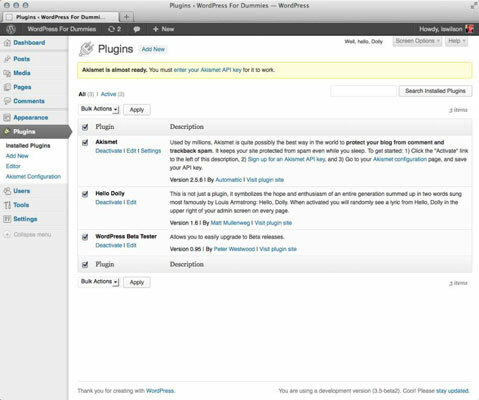 After you complete the WordPress software upgrade, you can revisit the Plugins page and reactivate the plugins you deactivated in Step 2 in the above list.